I do not remember seeing this type of letter box before so I assume that there are not many remaining. Described as an early twentieth-century cast-iron wall-mounted post box with raised G.R. insignia, set into the façade of 11 Morrison's Quay. "In accordance with the decision of Cork City Council on the 28th day of May 2007, the following structures were added to the Record of Protected Structures included in the Cork City Development Plan 2004." 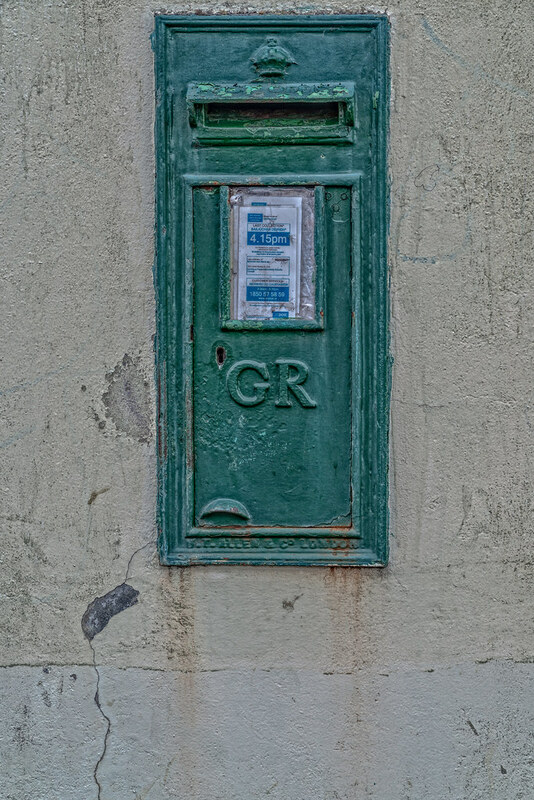 The letter box in my photograph is one of the structures added to the list. GR was used in the the British Isles [what is now the UK and Ireland] during the reign of George V [1910 - 1936]. In Ireland[ROI]from 1922 the Irish harp entwined with the letters "SE" for Saorstát Éireann, then "P&T" Gaelic script for Post and Telegraphs and from 1984 An Post with their wavy lines logo, often on the door as a raised casting. In the UK all post boxes display the Royal Cypher of the reigning monarch at the time of manufacture. Exceptions are the Anonymous pillar boxes of 1879–1887, where the cypher was omitted, and all boxes for use in Scotland manufactured after 1952 (including replicas of the 1866 Penfold design) which show the Queen's Crown of Scotland instead of the Royal Cypher for Elizabeth II. Royal Mail post boxes manufactured since 1994 carry the wording "Royal Mail", normally above the aperture (lamp boxes) or on the door (pillar boxes). Before this date all post boxes, with the exception of the Anonymous pillar boxes, carried the wording "Post Office".